A manicure that chips merely hours post-painting can leave you feeling — no pun intended — unpolished. It’s especially annoying when lacquer flakes before an important meeting, which seems to be the case more often than not. If you’re a proponent of the DIY manicure, you might be all-too-familiar with this specific frustration. Moreover, it’s not a coincidence that salon manicures tend to last longer than ones performed over the kitchen sink. Below, Rita Remark, Global Lead Educator for essie®, shares insider secrets for quelling the chip. Similarly, make sure your nails are free from any oil or hand lotion. If you suspect your nails are particularly slippery, swipe a little bit of nail polish remover or 100 percent acetone over the nail’s surface before you paint. A nail file can create a myriad of nail shapes, but it can also create nail problems if it’s of subpar quality. “An abrasive file can aggravate the tips of your nails, leaving them jagged and worse off than before,” explains Remark. Furthermore, rough edges make polish more prone to chipping. Instead of a coarser file, she suggests snagging a file with a high grit count. “The higher the grit number, the softer the file,” Remark explains. “Any file between 150-240 grit is a sweet spot for most.” Should you have super-sensitive nails (such as those damaged by gel manicures! ), you could opt for slightly higher counts. A basecoat is more than just an extra product; it’s what Remark calls “an absolutely necessary step in a longwearing manicure.” This is true for a few reasons. 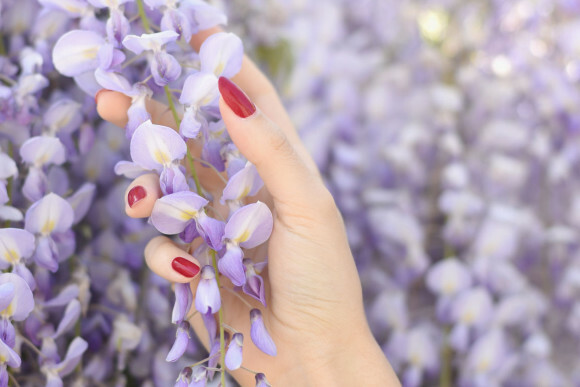 First, a strengthening formula (such as essie Grow Stronger Basecoat, $9) can improve nail health, which allows for a smooth canvas that’s less prone to peeling. Second, basecoat helps to create “an even stronger polish seal” onto the nail, says Remark. Just as super-matte lipsticks can flake from your lips, matte polishes chip significantly more easily than their glossy counterparts. Says Remark, “the ingredients cause the [matte] lacquer to dry slightly more brittle than other polishes, [ultimately] causing chips.” So, while you might love the look of a powdery finish, it’s best to avoid if you’re aiming for maximum longevity. Lastly, make sure you’re “capping” each nail (i.e. painting horizontally along the top). While it goes without saying that every manicure should end with a clear top coat, Remark suggesting recoating your manicure every few days: “This will re-stabilize your polish and add strength.” That means, those extra slicks of top coat may just extend your manicure’s life.